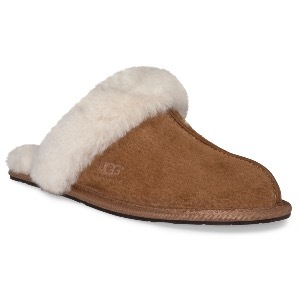 Always a favourite, the UGG Scuffette slipper is crammed with soft plush wool with a soft water-resistant suede upper. The UGG product platform is directed toward consumers who value luxury, comfort and the highest quality of footwear available. Only the finest materials are used in the construction of their products - the highest quality leathers and suedes, and of course, the world's finest sheepskin. Great care is taken to ensure that every shoe is going to feel great from the moment you try it on.